If you are looking to get an early start to the potato growing season, you can put your seed potatoes in quick start mode by “greening” or “chitting” before planting. They will be ready to plant outside as soon as conditions become favorable enough for growing. Your potato plants will be rocketing towards the harvest at light speed. 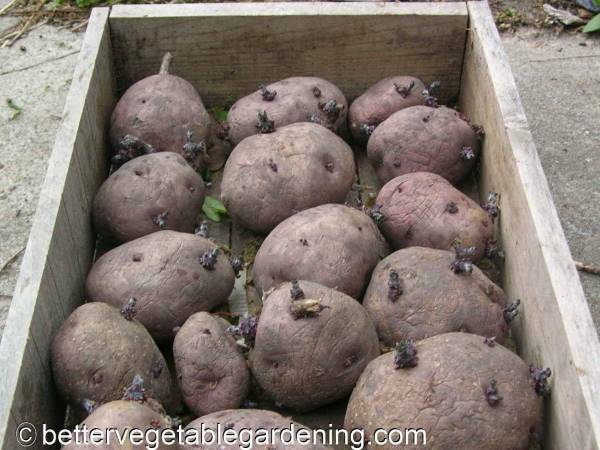 Keep the humidity high to prevent the potatoes from drying out to much and shriveling up. Shriveled potatoes will often still grow and produce but production will be poor. Lay out your potatoes in a single layer on the floor, planting tray or flats and expose them to indirect sunlight. If you have a large amount, the trays can be stacked on rakes or similar, as long as there is good ventilation and equal light. Let the potatoes sit in that warm environment for a week or two, until the eyes start to sprout. The sprouts will start to green up and you should let them grow to at least 1/2 inch (13mm) long before planting. Potatoes in flats being greened, "chitting", ready for planting. Short stout greened sprouts are reasonably tough and can be handled without being broken. 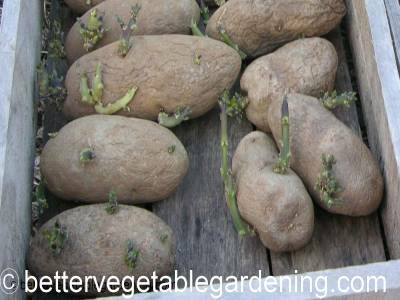 If the potatoes have started sprouting in the dark they will likely be too long for good greening, it is best to rub them off and let them sprout again under the correct conditions. Long sprouts are much more delicate and are easily broken off during handling and planting. Some of these greened seed potatoes have sprouts that are very long and quite delicate. These will be hard to handle and while they will grow without a problem there is the danger of them being broken off before they are planted. Using seed potatoes like this could cause you to lose the advantage of greening the seed. If planting is delayed for any reason you can slow down the sprouting process by keeping the potatoes to around 50 F (10°C) until you can plant them. 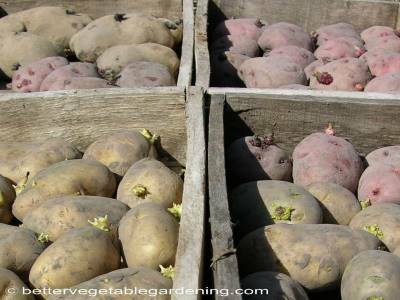 For planting large area of potatoes, chitting might not be practical due to the extra time and care needed when handling them. However even for larger plantings you can gain some benefit from warming seed potatoes. This is a simple matter of bringing your potatoes out of the cool storage environment into a warm area a week before planting. This will break the dormancy stage of their cycle and prepare them better for quick sprouting once they are planted.